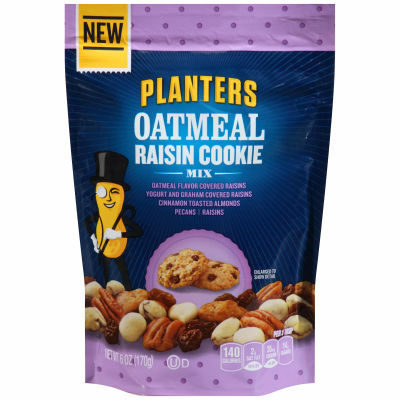 Planters Oatmeal Raisin Cookie Mix - Experience the delightful taste of a homemade oatmeal raisin cookie with this cookie-inspired mixture of oatmeal flavor covered raisins, yogurt and graham covered raisins, cinnamon toasted almonds, pecans and raisins. Perfect Fusion of Flavors - Snack guilt-free with the incredible flavors and textures of this mix, When you're craving a cookie, reach for Planters Oatmeal Raisin Cookie Mix in its convenient 6 oz. resealable bag.